Our product range includes a wide range of silicone beading, rubber seal, silicone profiles, silicone tubings, co- extrusion rubber profile and door stop seal. 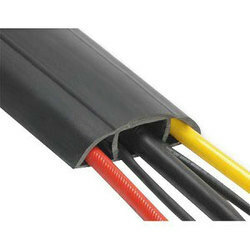 Extrudates are usually vulcanized via vertical or horizontal heating zones, with or without pressure. Silicone rubber is usually not vulcanized in a salt bath, though this option is possible in principle for peroxide-curing compounds. Vulcanization in Heating Zones without Pressure Tubing and profiles are usually vulcanized in a heating zone (at 200 – 500 °C) without the application of external pressure. Horizontal or vertical heating tunnels are heated by means of resistance heaters, infrared heating bars with reflectors, hot-air systems or ceramic dark radiators. The extrudates are conveyed on sheet-steel or mesh conveyor belts. The conveyor belts run on movable deflector rolls to compensate for the thermal expansion of the belt. Their velocity can be regulated. The conveyor belt return should be located in the heating tunnel to prevent excessive cooling. If this is not possible, use covers to prevent rapid heat loss. To avoid pressure marks resulting from the conveyor belt, a shock tunnel can be fitted upstream in horizontal heating zones to prevulcanize the parts at about 600 °C. In many instances, it is preferable to extrude vertically using an extruder head deflected through 90°. This prevents belt pressure marks, so that even very soft materials can be easily processed. We are mfg. 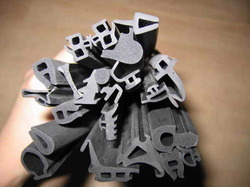 extrusion rubber profiles, seals, gaskets, beadings, channels, sections as per drawing, specifications according to customer requirements. We are manufacturing silicone rubber extrusion profiles, channels, sections, tubings as per customer requirement. We are manufacturing silicone rubber extrusion tubings, profiles, channels, sections on hitech microwave curing machines as per customer requirement. Co-Extrusion ExpertiseWith the co-extrusion process, Profile Xtrusions is able to construct a part with two dissimilar materials, while still maintaining the physical properties of each. This extrusion process works effectively through the combination a rigid material, for strength, and a soft or flexible material, for function, into various uniform profiles. For example, when a rubber gasket must be attached to a metal part to provide a closure seal, a dual durometer extrusion combines both functions into one piece, which significantly reduces assembly costs while enhancing performance and function. These are generally compression seals. Some are mounted on the door stop or directly onto a plain frame of the door, thereby providing a door stop seal. Some seals can be fitted to the door or neatly rebated into the frame itself.